Hotel and plantings near the Edgewater Park Site, Iowa. 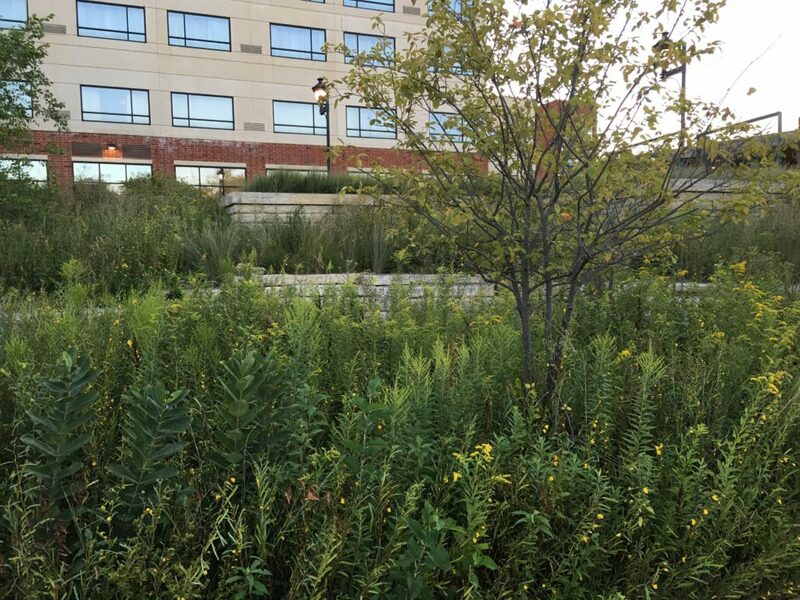 The redevelopment of that Coralville, Iowa wetland park/restaurant/hotel complex uncovered a prehistoric archaeological site officially known as the Edgewater Park Site (13JH1132). The initial survey by archaeologists prior to construction discovered that artifacts were present about one meter below the ground surface. Therefore, the upper meter of soil was removed over a 10 x 10 meter area (near the current parking garage) to expose the artifact-bearing layers. 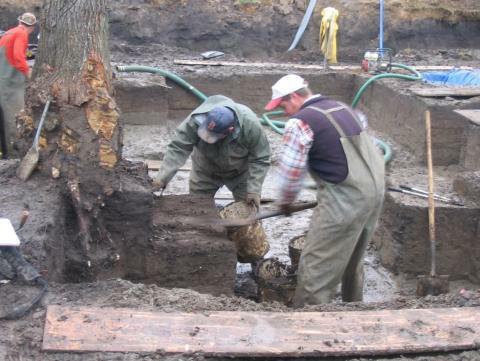 Excavation at the Edgewater Park Site, Iowa. Source: The Office of the State Archaeologist, Iowa. The dig recovered about 15,000 artifacts. Most of these are stone flakes, but there are also 17 projectile points. Ten of these are Table Rock points, a side-notched biface similar to the widespread Late Archaic Durst, Dustin, and Lamoka points found elsewhere. 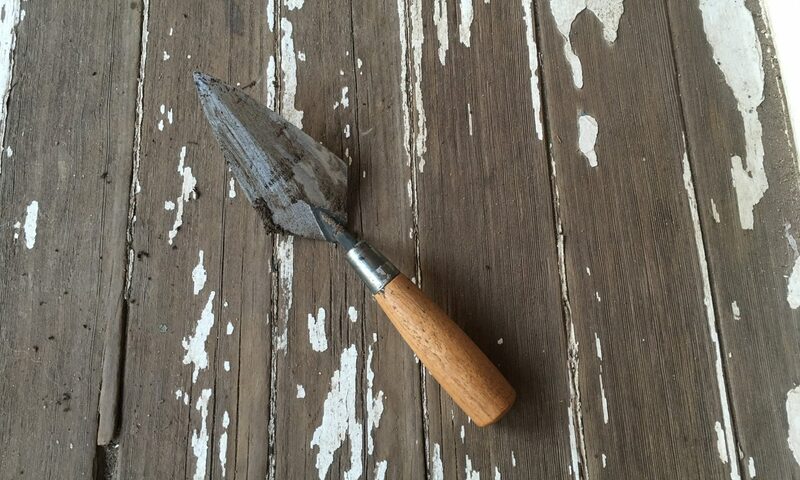 The only other diagnostic point is a Stone Square Stemmed point that also dates to the Late Archaic. Concentrations of fire-cracked rock likely are the remains of several hearths, and the distribution of the stone debitage (primarily Maynes Creek chert, which is found naturally about 100km away from the site) may reveal areas where individuals were creating stone tools between 3,500 and 3,900 years ago. Three types of plants found at the site, barnyard grass, little barley, and knotweed, could possibly have been cultivated there. 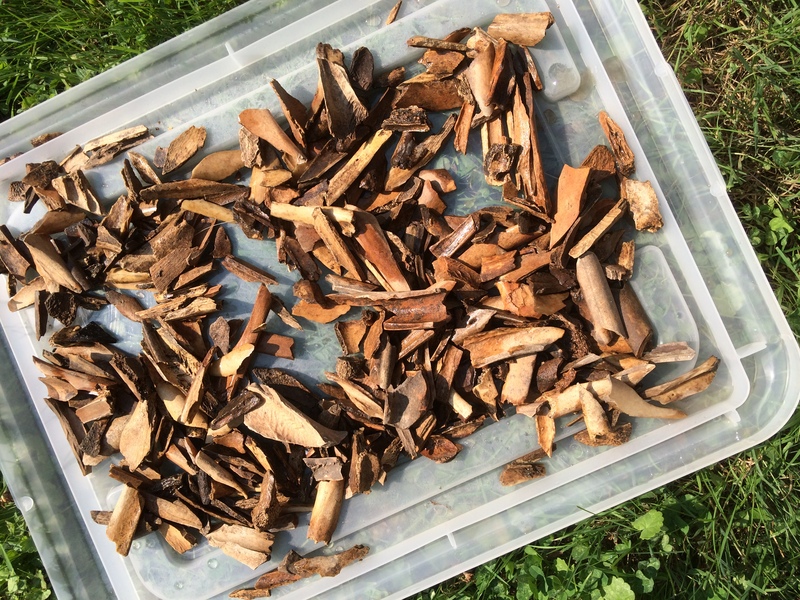 Archaeologists think that the Edgewater Park site was a warm-weather camp temporarily used by hunter-gatherers who may have also been beginning to use domesticated plants. The Office of the State Archaeologist of Iowa has more information on the Edgewater Park Site, and photos of the excavation can be seen on Flickr. 2007 Edgewater Park: A Late Archaic Campsite along the Iowa River. Midcontinental Journal of Archaeology 32 (1):5-45. Bone effigy deer’s head found on Frontenac Island, NY. Source: Cadzow 1925, Figure 33. The Frontenac Island site in Cayuga Lake, New York, was excavated by William Ritchie in 1939-1940, and then again several years later. The first professional excavations on the island, however, were conducted by Donald Cadzow for the Museum of the American Indian around the same time Ritchie was beginning to excavate the Lamoka Lake site. 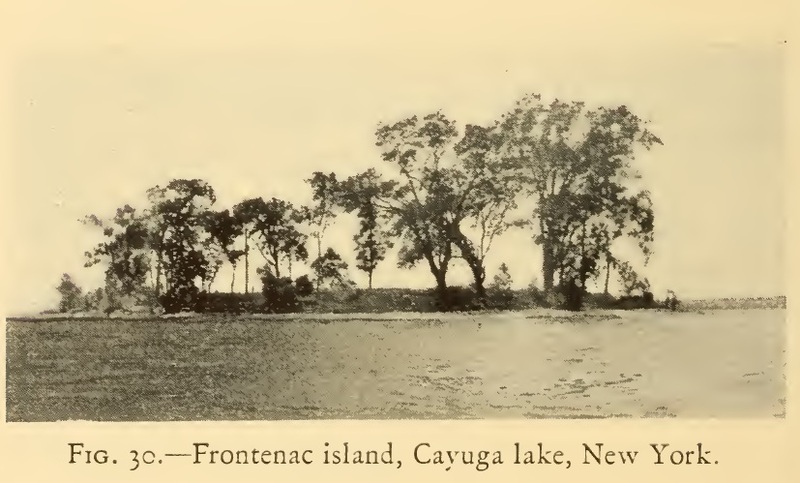 “For many years Cayuga county, New York, has been a happy hunting-ground for commercial pothunters and local diggers,” Cadzow wrote, but Frontenac Island had “been protected for many years by public-spirited citizens living nearby.” (p. 56, 58) Cadzow received permission from the island’s owners (the village of Union Springs) to dig on the island, beginning in late July 1924. Excavations were limited, but finds included pottery and human burials. 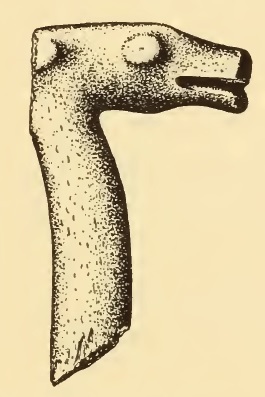 Included with one of the burials were four stone plummets, one winged bannerstone, a bone animal effigy interpreted as a deer’s head, three beaver incisors, one notched point, three antler flakers, two bone “arrowpoints” (one looks harpoon-like) and the left humerus of a swan, which had been cut and polished and perforated. Bone “arrowpoints’ from Frontenac Island, NY. Source: Cadzow 1925, Figure 35. Frontenac Island. Source: Cadzow 1925. 1925 Prehistoric Algonkian Burial Site in Cayuga County, New York. Museum of the American Indian, Heye Foundation Indian Notes 2(1):56-63. The New York Archaeological Council (NYAC) publishes a poster for Archaeology Season (formerly Archaeology Month) every year. 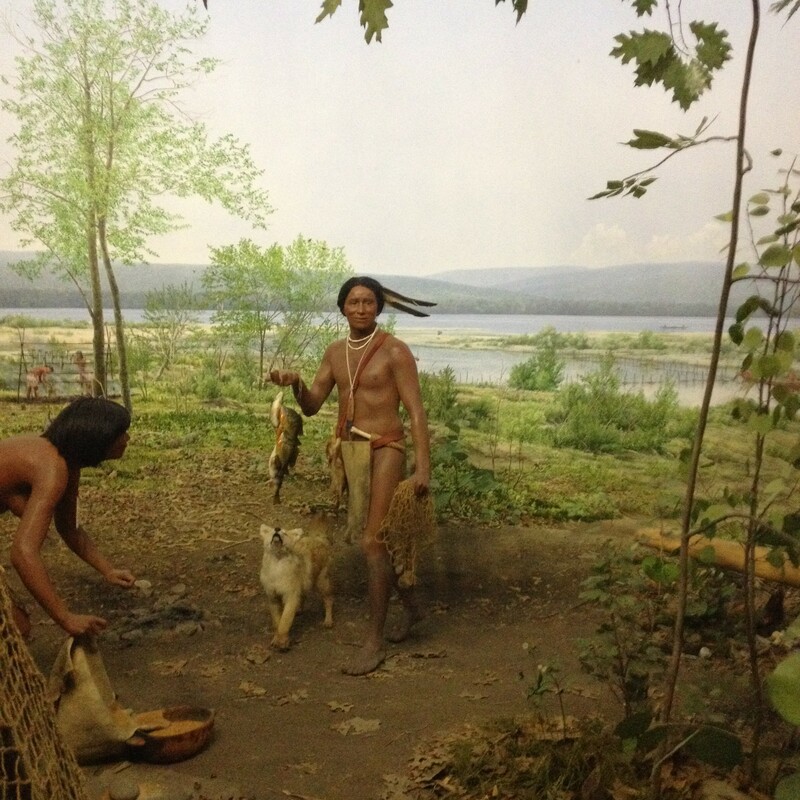 In 2008, the Lamoka Lake site (and the Lamoka Life Group diorama from the New York State Museum) were featured. Check out the (never before seen?) photo of William Ritchie excavating at the site in 1962. 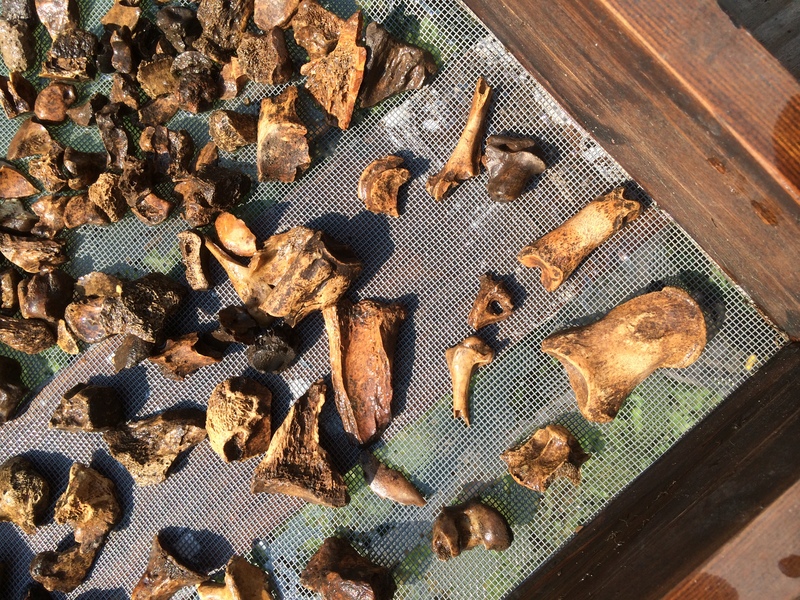 A sample of bones from the 1991 Lamoka Lake excavations. Lots of identifiable stuff here. 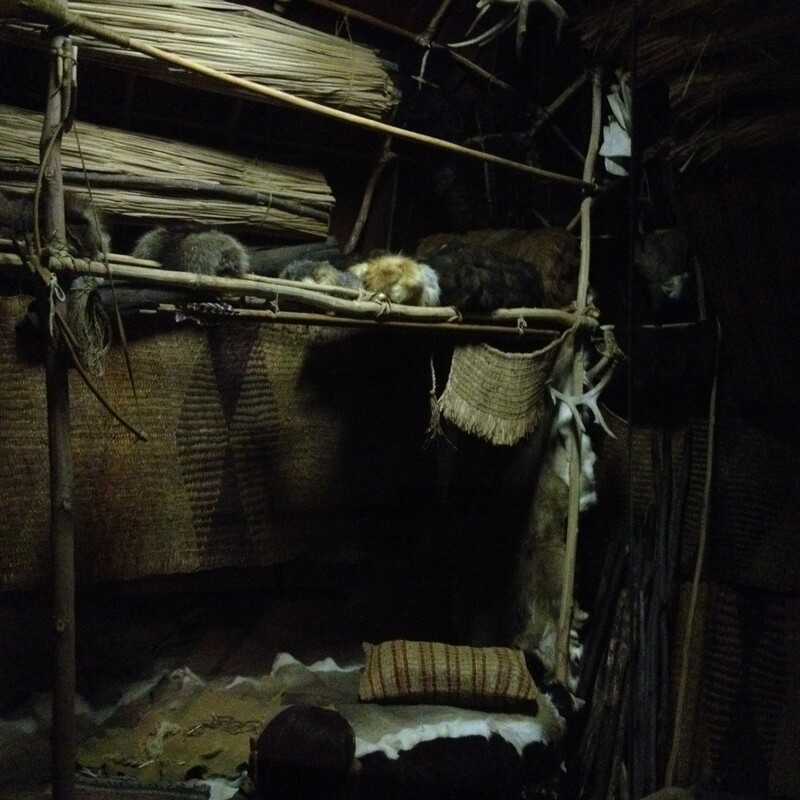 Here’s a photo showing part of the interior of the house in the Lamoka diorama at the New York State Museum. The lodge itself is based on Ritchie’s interpretation of the numerous post molds and features he described as floors at the site, as detailed in his book The Archaeology of New York State. The contents of the interior of the lodge are more speculative. Some items are based on actual artifacts found at the site, like the antlers seen hanging from one of the wooden supports. Others are undoubtedly inferred from more recent Native Americans, ethnographic hunter-gatherers, and other archaeological evidence. The textiles in particular are beautifully done. by Kristen Snarey and Christopher Ellis). In 1950, the Rochester Museum of Arts and Sciences donated several modified bone and antler artifacts from the Lamoka Lake Site to the Smithsonian Institution. 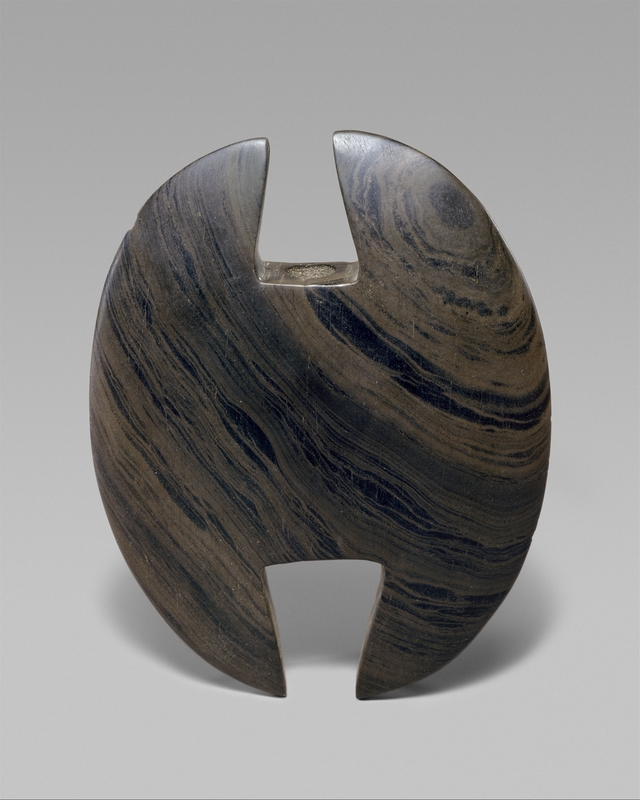 One of them was the artifact above (Accession No. 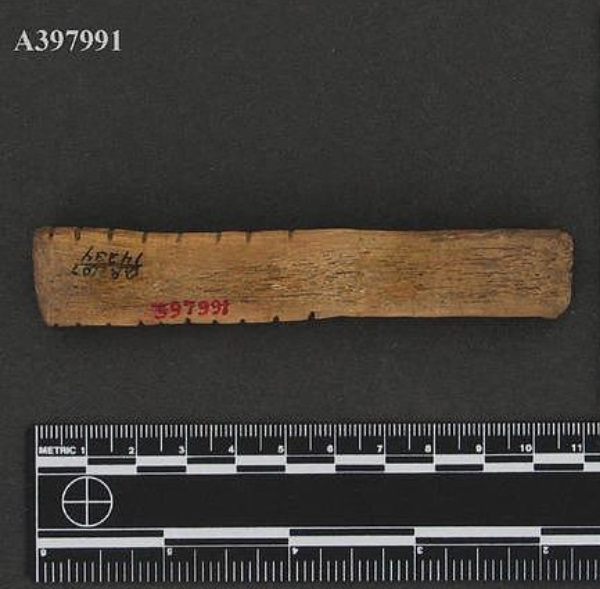 A397991), made from a white-tailed deer or possibly elk (wapiti) antler. 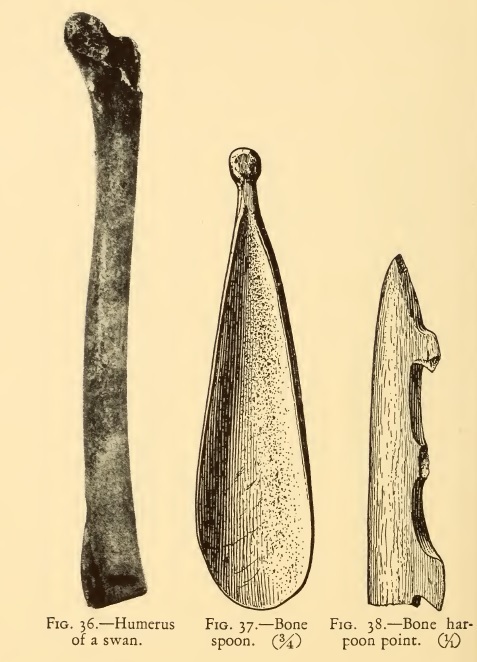 William Ritchie, in his 1932 report, considered this and other artifacts like it as possible pendants, amulets, or tally sticks. They may also have had a more practical use. Some antler artifacts from the site were also decorated with red ochre stripes. To my knowledge, these artifacts have not been studied by anyone else since the original analysis by Ritchie in the 1920s.